I wanted to click on the "like" button for this post...but there isn't one haha. Good to see you back in blogland. The scarves are gorgeous. 'Tis the season for short-term projects, I think. Too much other stuff to distract this time of year! Just gotta add...they wouldn't let you pee? Really? That's simply awful! Have a blessed evening bird-watching! HUGS! I am so glad you are back...you were missed! The scarves you have done are simply gorgeous. I just know your mom is going to love her's and how great that you have another ball of yarn for yourself! Enjoy all the birds...and buy yourself some food! Your scarves are beautiful! I hope you're enjoying spring!!! I'm so glad you are back! I thought for sure you must have become an Aunt. Recharging is good for the soul, though. Glad to see you posted and the scarf is very pretty that you made for your Mom! Take care and enjoy your birds! Stacy, it is lovely to see you blogging again, I was really worried:) Your knitting is wonderful. I've always liked Noro yarn. I used some of it to make a Clapotis years ago, and I love the long runs of colour. I sure have missed you Stacy. I haven't been knitting much either. Baseball is starting w/my son, so I'm finishing up a 2nd sock. I'm at so many critical junctures in my projects and too much busy-ness going on! But that is my life right now. I love the scarf you knit for your Mom. I have been all about easy pattern lately too. What a lovely scarf for your mother. I love the colour and texture! Welcome back! Sometimes things just get so hectic don't they? I haven't done much on any of my projects for a while now either. Must be something in the air. Seriously, you drove all that way and they didnt let you use the loo? How mean. Great to see you back. You're Mum will love that scarf. Glad you are back, I understand about losing the blogging/creative mojo. I took a vacation myself and actually went somewhere...the Grand Canyon! Love your scarf you made for you mother and glad you have some left for one for you, too. 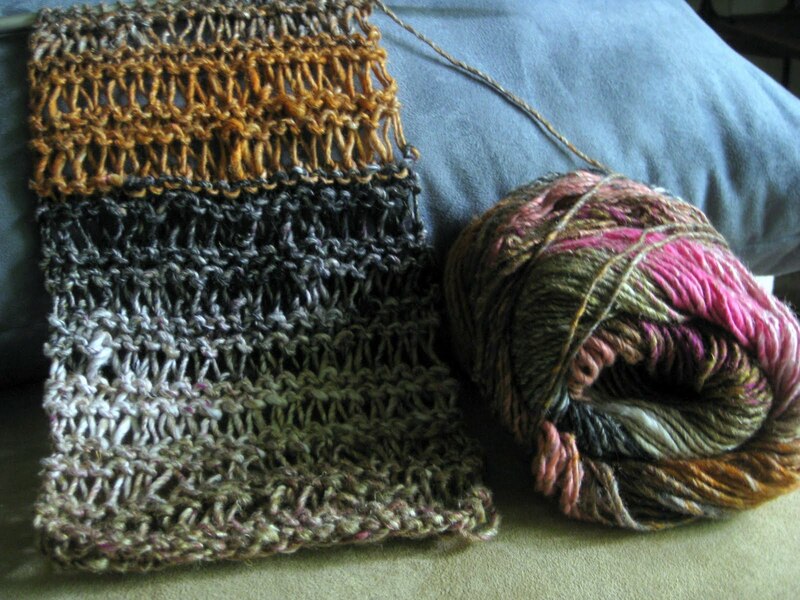 And...I think that noro yarn and scarf is beautiful. I did finish a crochet infinity scarf on vacation...road trips are a great time to crochet, I think. Well, if you had to pick time for not blogging, thank you for making it happen while I was gone LOL. I hope your mojo is really kicking back into gear. Your scarves sure are pretty if that's any indication! I also have taken some time off. I love the scarf for your mom. I am sitting here eating m&ms. Happy Auntie days to you. Welcome back and glad you got your mojo back.. what sort of shop won't let you use their rest room when you have driven miles to them.. Answer= One you don't use again!! How mean and petty some people can be.. but you survived as you're back to knitting and blogging. 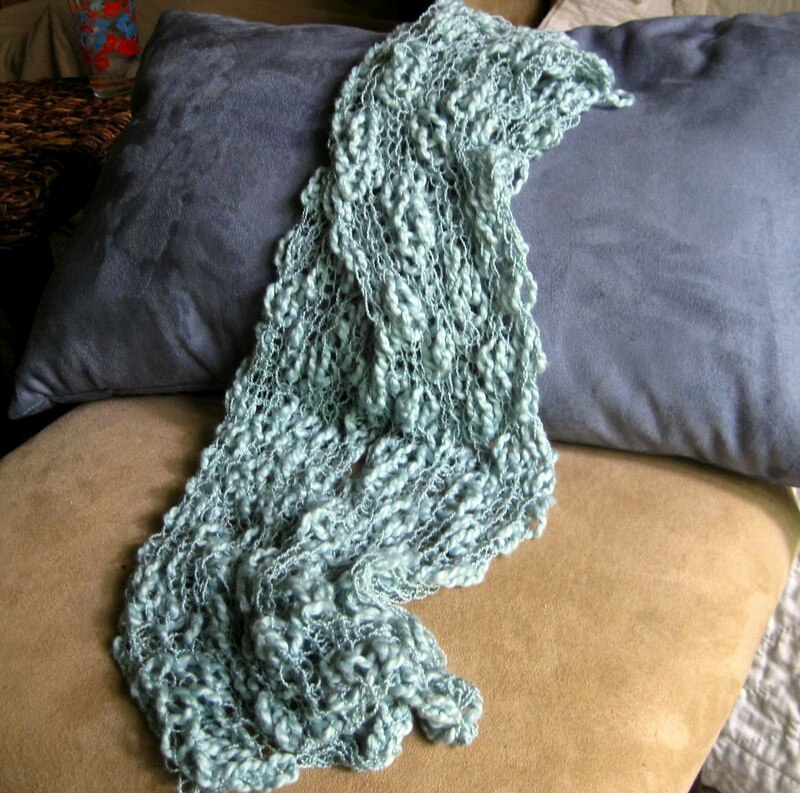 Love the stitch you've used for the scarf and I am sure your Mum will love it.